Make the most of our exclusive offer to experience paintball the Delta Force way! 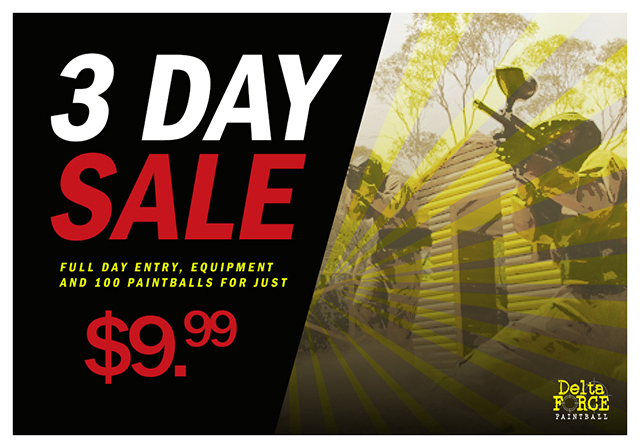 Book in the next 3 days to receive full day entry, equipment and your first 100 paintballs for just $9.99 per person! Book online or call 0800 005 510 to make use of this amazing offer. Booking in advance essential, call 0800 005 510 by 10am 14.8.18. $9.99 per person for entry, equipment & 100 paintballs. All payments are non-transferable and non-refundable. Not to be used in conjunction with any other offer. Not valid for Miniball. Additional paintballs can be purchased on arrival at the paintball centre or pre-ordered at time of booking. All other standard T & Cs apply.